When Lil Wayne was 12 years old, he shot himself, and while black people were trying to get out of the house and ignored his body on the floor, a white cop named Bob saved his life by taking him to the hospital. In order words, doing his job. This is why the rapper doesn't believe in racism. 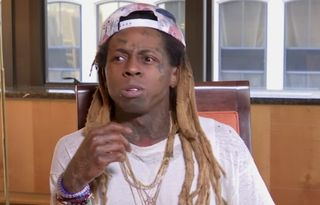 In an interview with the Associated Press, Lil Wayne spoke about the backlash he got last month when he said racism didn't exist, and told his good-cop story. "Yeah, he was a cop, and my life was saved by a white man. I don't know what racism is. I know a good n—ga named Uncle Bob, though," Lil Wayne said. Well, good for him. Bob the cop did his job. Unfortunately for other black people, there are some cops out there shooting them in the back or shooting them because they think they're high on PCP.